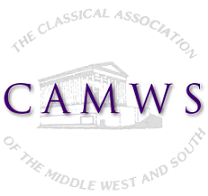 The Classical Association of the Middle West and South offers cash prizes, book awards, and awards of commendation to qualifying winners in its School Awards Latin Translation Contests for college/university students. Colleges or universities administering this one-hour exam must be institutional members of CAMWS. This examination must be administered between Monday, November 26 and Friday, December 7, 2018. (The last weeks of November are also an option for those institutions with limitations caused by their academic calendars.) The exam may be administered by an instructor (or proctor) during regular class time, but the instructor or proctor may NOT answer any questions or provide any other sort of assistance. Students should translate as literally as possible without violating English idiom. They are responsible for the vocabulary on the Dickinson College Core Latin Vocabulary list. Any words not appearing on this list will be glossed. The Intermediate College Exam is open to elementary or intermediate (i.e., first- or second-year) Latin students, no matter how many years of Latin they may have previously had. It is designed for students who have learned most basic Latin grammar but whose translation experience has primarily involved adapted prose passages. The top 5 students in the Intermediate College Exam will each receive a certificate and a $100 cash prize. An additional 10 outstanding contestants will receive a book prize relevant to classical antiquity. Additional writers of meritorious examinations will receive certificates of commendation. The Advanced College Exam is open to students in their third-year of college Latin and beyond, no matter how many years of high school Latin they may have previously had. The advanced translation exam alternates annually between poetry and prose. The 2018-2019 exam will feature a prose passage (e.g., Caesar, Cicero, Sallust, etc.). The top 5 students in the Advanced College Exam will each receive a certificate and a $250 cash prize. An additional 10 outstanding contestants will receive a book prize relevant to classical antiquity. Additional writers of meritorious examinations will receive certificates of commendation. Winners will be announced just before or at the annual CAMWS meeting. All questions about the college exams should be directed to the Chair of the Subcommittee on School Awards at schoolawards@camws.org. Registration for this exam is due by November 1, 2018. To register for the contest, complete this Contest Registration Form. Please note that a $2 non-refundable fee underwriting the costs of the examination is required for each contestant.